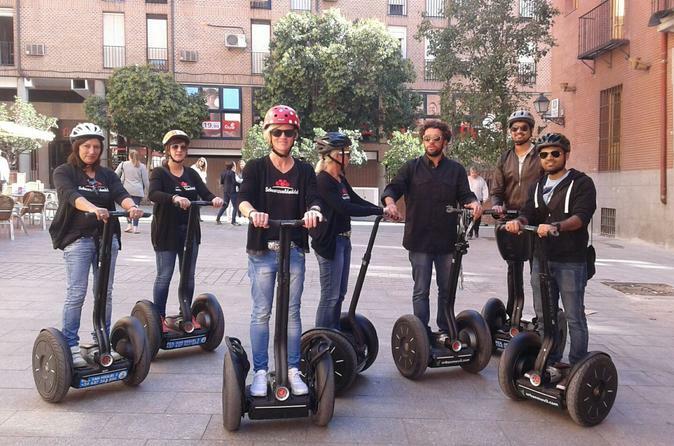 Embark on a guided Segway tour by the most emblematic spots in Madrid town, knowing the city history, anecdotes and unique landscapes. During 1 hour and a half, and after a short training of 2 or 3 minutes per person, you will visit various tourist spots like: Madrid de los Austrias, San Miguel Market, gourmet place where you can taste Iberian and all the world products, Almudena Cathedral or the Royal Palace, inevitable destinations in the capital of Spain, Madrid-Rio, the famous Puerta del Sol, and the Plaza Mayor, whose origin dates back to the sixteenth century. You will receive helmets before training and then begin your tour for the Plaza de la Villa, Plaza Mayor and Sol, then visit the Almudena Cathedral and the Royal Palace, go down the Sabatini Gardens to Madrid Rio park, to finish the tour at the temple of Debod, an original Egyptian temple dating from 2200 BC.